equipment used to help teach children. Ryman Stationery has been selling such items for almost 125 years. Whilst modern technology and mindsets have both adapted and created many products, the ethos of the company remains the same: to deliver an unrivalled product range to help develop and inspire young minds. Schools within the 1890s were of course far more rudimentary than those we recognise today but it was the 1891 Elementary Education Act which proved a turning point for education within England. This Act provided state payment of school fees of up to ten shillings per child (aged between three and fifteen), which in turn allowed for primary education to become a free institution*. This of course enabled a huge number of children, who may previously not have been able to afford an education, to attend school and practise academic learning. Whilst at first we may not draw any comparisons to Victorian schools, there are many similarities to today’s classroom.Many items which Ryman Stationery continues to sell have stood the test of time since Henry Ryman opened the doors of his first shop on Great Portland Street, London in 1893. In contrast of course, there are thousands of stationery objects which have evolved and developed over the years, to keep up with demand and expand into both 20th and 21st century life. The Oxford Wooden Ruler (£2.49) was first introduced into classrooms in 1887 and the plastic Oxford Ruler (£0.99) swiftly followed in 1899; only six years after Ryman had been established. Although perhaps the materials have altered, the principles of these stalwarts are ever-present. 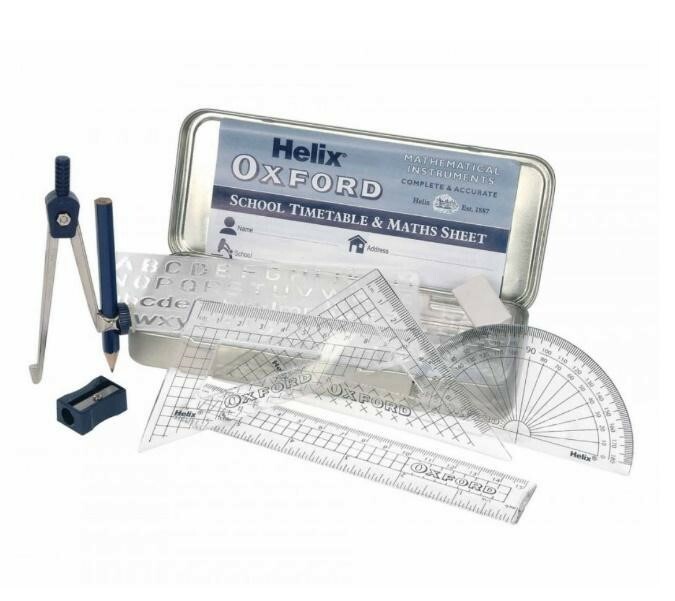 Take for example, the Helix Oxford Maths Set (£1.49) for example. First introduced in 1912, this set is as ever popular today, but has kept up-to-date with contemporary tastes. (£6.89) are ever present in both classrooms and exam rooms and the Casio CG-50 Graphic Calculator (£99.99) goes one step further to bring calculations to life via a coloured LED screen. Despite no longer used to write upon a piece of slate, chalk is still very much used today, whether to write upon a blackboard or for use in the art department. These Smalls White and Coloured Chalks (both £0.99) are the perfect addition to any child’s creative kit. Likewise, the Koh-I-Noor Aqaurell Drawing Set (£110.99) is presented in a beautiful wooden box and boasts 21 pencils for sketching and watercolour use. Like their ancestors, children can be inspired to draw and create using both their surroundings and imaginations. Children are encouraged to be creative and put their own stamp on school work, using colourful and bespoke stationery. Individuality is exemplified within the Ryman Personalised Notebook range Additionally, writing materials have advanced hugely throughout the centuries and children have the scope to use hundreds of different tools. For a real heritage feel, there’s nothing quite like quill and ink. Parker, founded in 1888, five years before the first Ryman store opened, has been sold in Ryman stores for decades and their simplicity and elegance thrives two centuries later. Today’s fountain pens can be used with a traditional pot of ink such as this Parker Quink Ink (£7.99) or for ease and less risk of spills, Parker Ink Cartridges (£4.99). If mistakes are ever made, it’s never been easier to keep work neat and tidy. The Tippex Pocket Mouse Correction Tape (£4.29) allows children to eradicate mess or errors within their workbooks. Whilst pencils and chalk may have been standard tools for Victorian children to write with, pupils in 2018 often use keyboards to do so. The HP Wireless Keyboard K2500 (£24.99) allows for quick and easy typing, without the need for messy electrical cables. And talking of technology, the use of printer ink cartridges become standard practice for school children. Using computers to compose essays and create projects has become standard practice throughout modern schools. In this respect, paper is of course used but in a modern, digital method. Whilst the world is ever-changing, the Earth we see today is not so different from that 125 years ago. Globes were used throughout Britain’s schoolrooms to teach Geography and whilst this Ryman Illuminated Antique Effect Globe (£24.99) now has the modern addition of an illuminated feature, it’s purpose remains, and helps to bring the continents and oceans to life. Taking global exploration one step further is the interactive Oregon scientific globe. Touch, find and compare over 250 countries with this multi lingual genius. For children who love nature, this Colour by Stickers Wild Creatures book (£6.99) is a modernised alternative to the original colouring book. A fantastic way to keep small ones entertained and allow them to create a perfect picture, every time. Media information provided by Famous Publicity. For further information please contact Mary-Jane Rose at mary-jane@famouspublicity.com, or Joanna Mason at joanna@famouspublicity.com or Tina Fotherby at tina@famouspublicity.com or call the office on 0333 344 2341. This press release was distributed by ResponseSource Press Release Wire on behalf of Ryman Stationery in the following categories: Children & Teenagers, Men's Interest, Entertainment & Arts, Leisure & Hobbies, Women's Interest & Beauty, Consumer Technology, Education & Human Resources, Retail & Fashion, for more information visit https://pressreleasewire.responsesource.com/about.